Christmas came early at the White Room supper club. Our hostess, Claudia, put on a lovely festive feast at her chic, modern and very white apartment. As it was a particularly cold night, the pomegranate- infused mulled wine, tasty 'Devils on Horseback' and mini duck confit croustades were the perfect welcome. 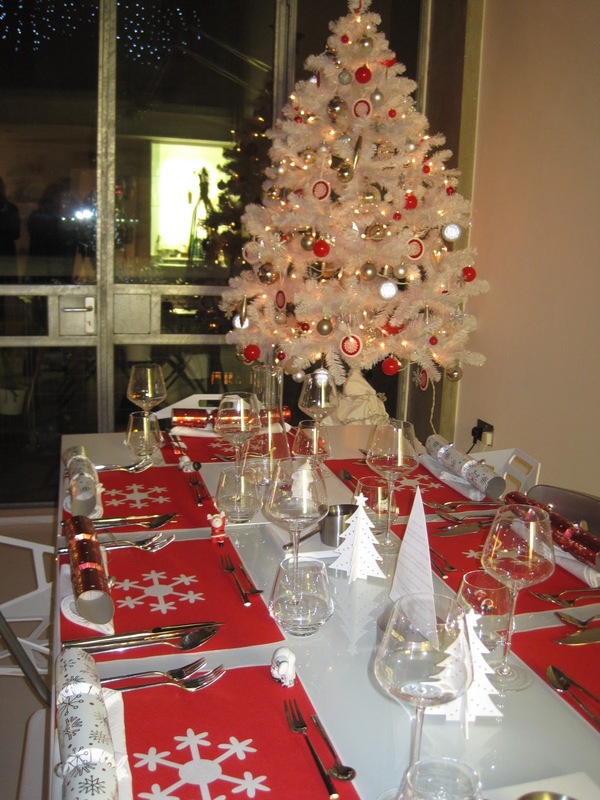 There were ten of us for dinner which made it quite an intimate evening as we all sat at one large table which was creatively decorated with Christmas fayre in dominant red,silver and white, complementing the large white tree illuminating the corner of the room. There was a strong continental flair to the night as the majority of guests came from Germany, Greece and Romania, with only myself and one other guest as the UK contingents. Claudia put on a large spread which she produced effortlessly, making everything from the cider and pumpkin soup, and gin & tonic granita (complete with edible silver stars) to the venison with chocolate and elderflower sauce (served with a lot of sprouts!) followed by homemade Christmas tree shaped biscuits to accompany the delicious cinnamon vanilla mousse.